He is absolutely correct and today we are going to go through some of the longer-term charts to show the risk currently at hand. 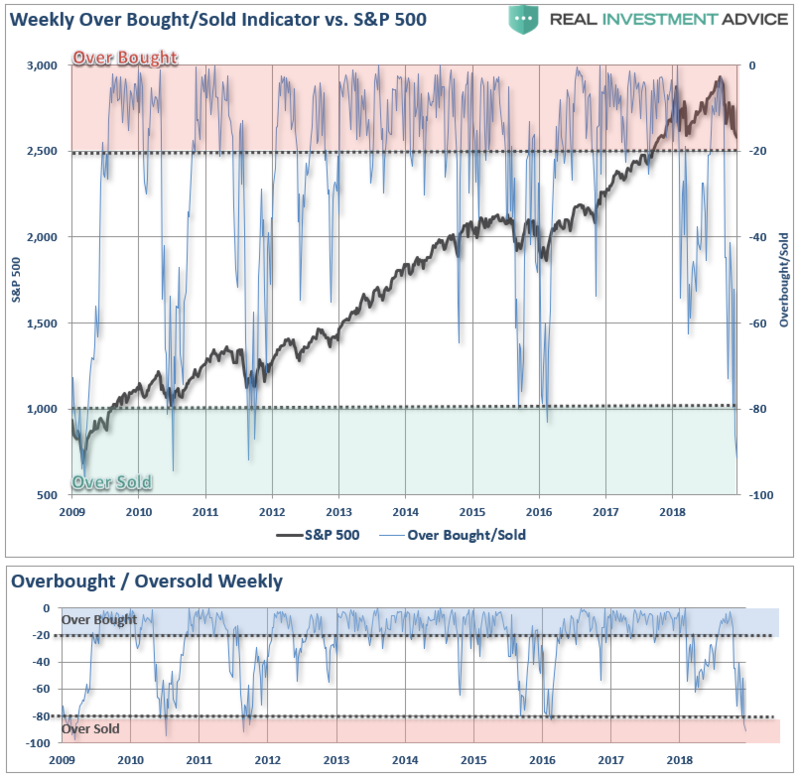 On a weekly basis, the market is clearly oversold and, historically speaking, such conditions have led to reflexive bounces. However, it is important to note the difference between “bull” and “bear” markets. During bull markets, markets trade above their longer-term moving averages and can remain overbought for extended periods of time. 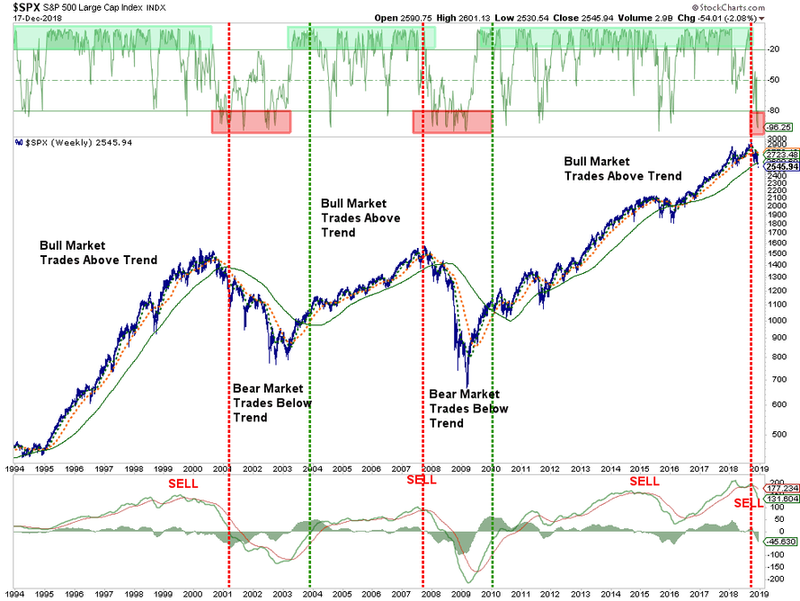 During “bear” markets, the opposite is true as markets tend to trade below their long-term means and remain oversold. So, while it is very likely the current oversold condition will lead to a short-term bounce, it is likely an opportunity to reduce risk into. 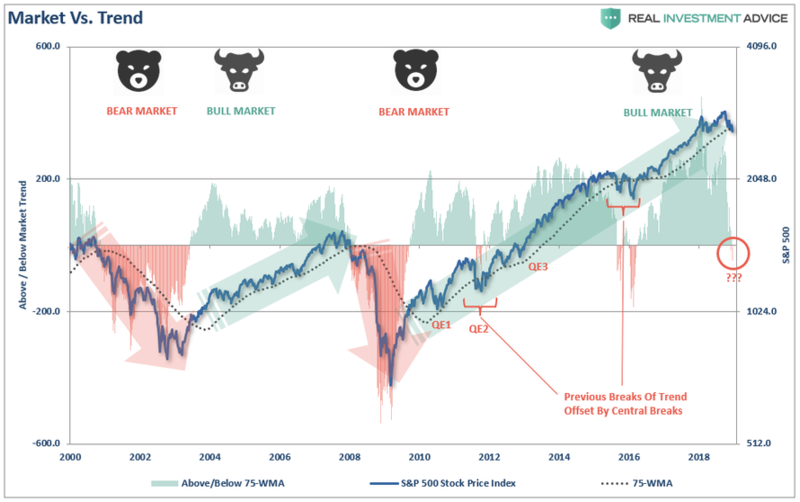 “Chart 1 plots weekly price bars for the SPX since the start of 2016 when the last ‘up-leg’ of its nearly ten-year bull market started. And the chart strongly suggests that the nearly three-year rally has ended. First of all, the rising trendline starting in early 2016 was broken during October. That previous support line has acted as a resistance line above short-term rallies since then. That’s a negative sign. 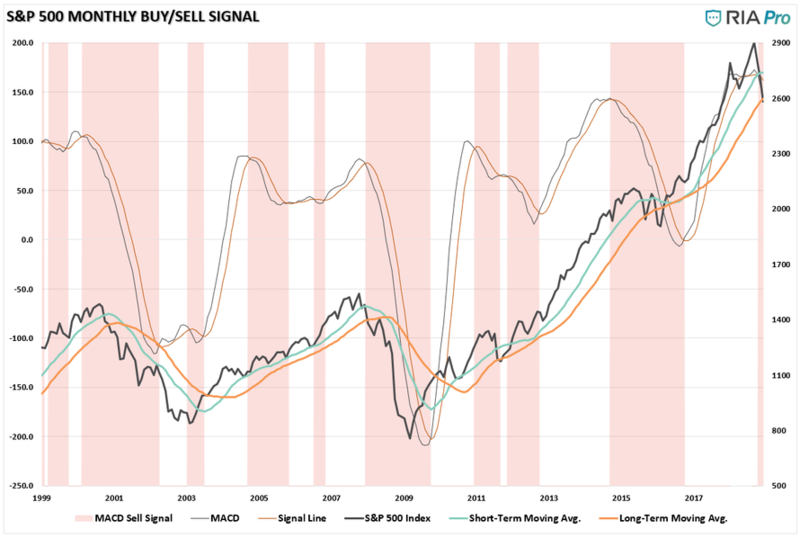 Most importantly, the long-term weekly sell signals have turned negative as well. This combined signals are rare in nature and historically have been worth paying attention to. On a monthly basis, the data is also suggesting that a “bear” may indeed be stalking investors. IMPORTANT NOTE: While we are discussing these technical issues today, monthly signals are ONLY VALID on the first day of the following month. So, if the markets were able to rally to all-time highs before the end of December, these signals would all be potentially reversed. 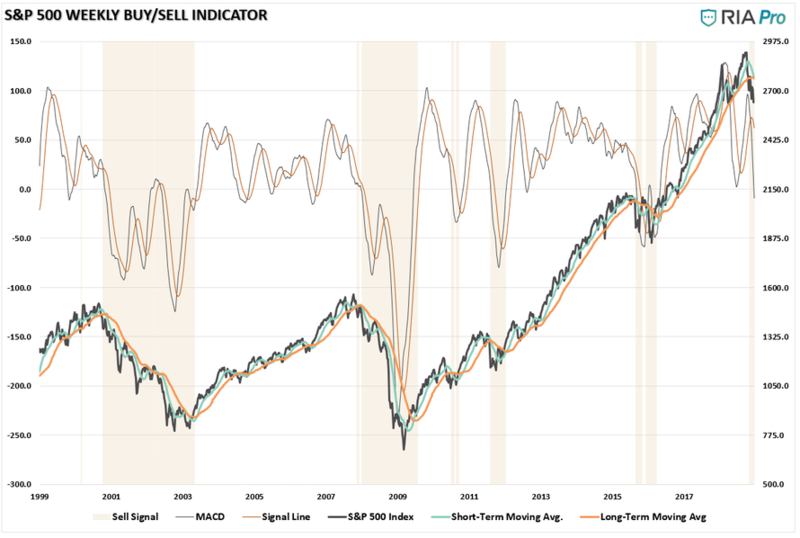 Of the monthly signals we follow, the shorter-term signals have all recently crossed back into “alert” territory suggesting the pressure on stocks remains lower for now. However, as shown, given this is a short-term signal, it issues alerts which do not always indicate the beginning of a bear market. 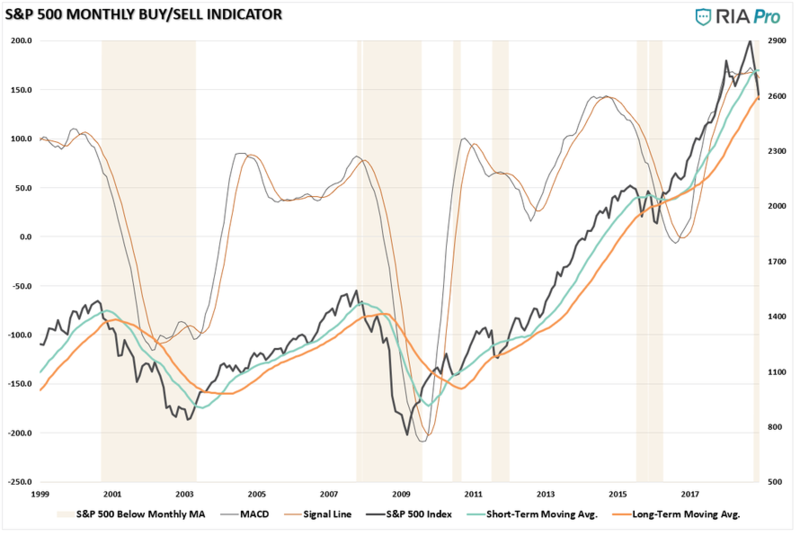 However, once we move to the longer-term indicator, the picture becomes substantially clearer. There are two very important points to take away from the chart above. 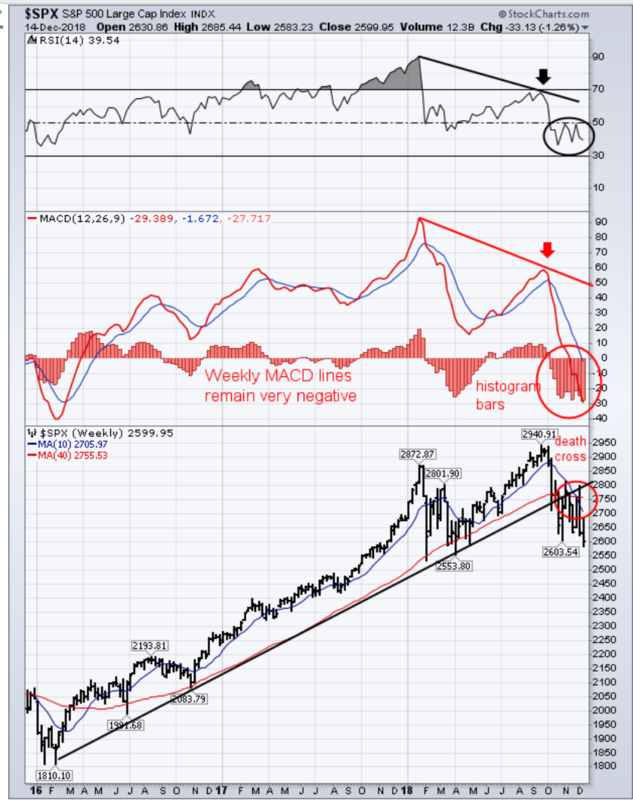 The market has violated the long-term moving average which has only occurred 3-times previously: 2000, 2007, and 2015. “Quantitative investing based on computer formulas and trading by machines directly are leaving the traditional stock picker in the dust and now dominating the equity markets. 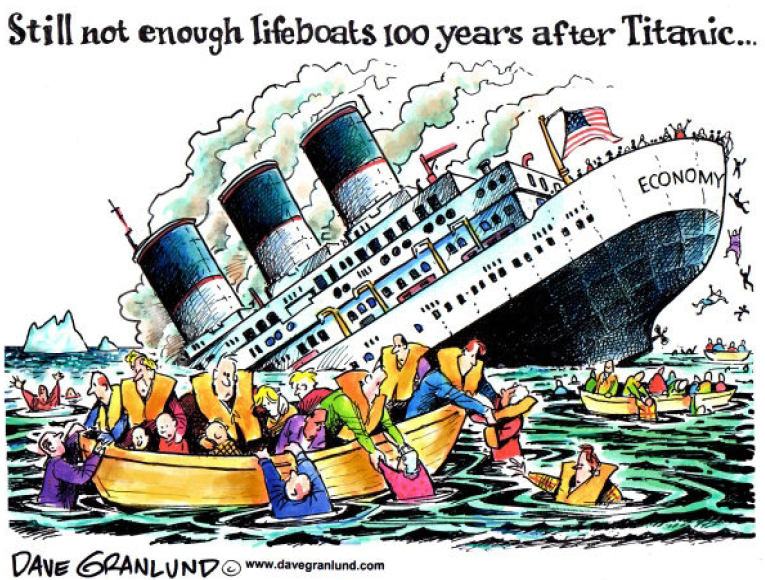 Herein lies the single biggest threat to the bull market. But what happens when these algo’s reverse course and rather than “buying the f***ing dip,” they begin to “sell the f***ing rallies” instead?